MEGL accepts applications for research interns every semester and summer. Funding is available for work-study students, and qualified students can earn course credit or work towards an honors thesis. Please see the MEGL web page for details. Ph.D. students gain industrial experience through immersion in commercial and government labs. Students participate in interdiscipliary projects with GMU and external mentors. Information on the program is available at the IIP web page. The Mathematics Department has an agreement with Fairfax County Public Schools for FCPS-GMU Dual Enrollment Courses. Mason's popular program for young math and tech students. Information: Mathematics and Technology for Talented Youth program, organized by Math professor J.E. Lin. Students majoring in mathematics take courses in the logical foundations of mathematics, the calculus sequence, matrix algebra, and discrete mathematics. Majors choose from a concentration of applied, traditional, or actuarial mathematics. Both the B.A. and the B.S. in mathematics will allow entry to advanced studies or career opportunities as diverse as the fields to which mathematics is applied. The metro region of Washington, DC is a particularly fertile area for related job opportunities, including consulting, teaching, and government. Mason offers a vibrant graduate mathematics program that awards M.S. and Ph.D. degrees. Students can specialize in a diverse selection of areas in pure, applied and computational mathematics. 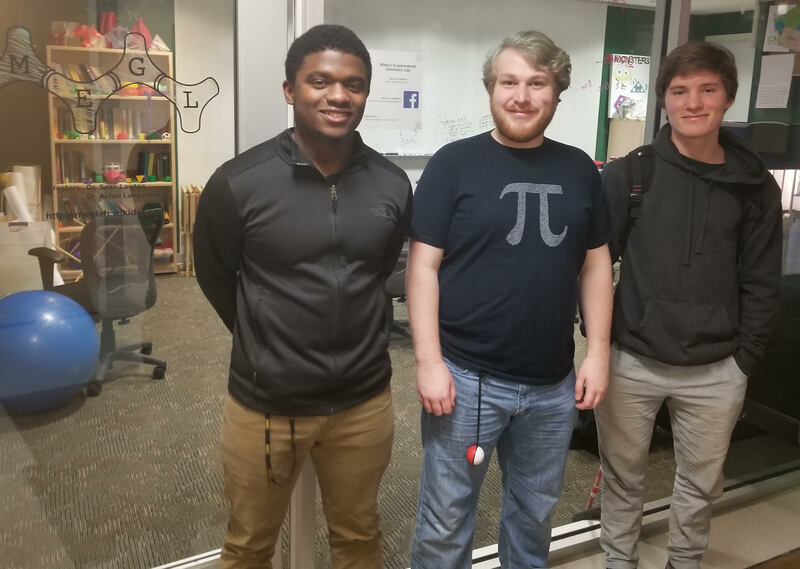 Congratulations to Avery Austin, Heath Camphire and Sam Schmidgall, who took part in the MEGL project "Nonholonomic motion planning for self-driving cars" with Dr. Lukyanenko. Schmidgall's poster presentation on the project won an Outstanding Poster Award at the 2019 Joint Mathematical Meetings in Baltimore. See more math department activities at our Highlights page. Since it was founded in 1972, George Mason University has grown into a major educational force and earned a reputation as an innovative, entrepreneurial institution. Just minutes from Washington, D.C., George Mason has a growing and diverse student body and an exceptional faculty of enterprizing scholars. At the center of the world's political, information, and communications networks, George Mason is the university needed by a region and a world driven by new social, economic, and technological realities. The Mathematical Sciences Colloquium will meet on Friday, Apr. 19 at 3:30 in Room 4106, Exploratory Hall. Will Traves of the U.S. Naval Academy will talk on From Grassmanians to automated geometric proofs. The next meeting of the CAG Seminar will be Friday, Apr. 19 at 12:30 in Room 4106, Exploratory Hall. Dan Cranston will talk on Circular coloring of planar graphs. The next meeting of the Applied and Computational Math Seminar will be Friday, Apr. 19 at 1:30 pm in Room 4106, Exploratory Hall. Wujun Zhang of Rutgers University will talk on Rate of convergence of numerical optimal transport problem with quadratic cost. The next meeting of the TAD Seminar will be Friday, Apr. 19 at 2:30 pm in Room 4106, Exploratory Hall. Brian Collier of the University of Maryland will speak on Special nilpotents and higher Teichmuller spaces.